It is that delicious time of the year: lazing around in the garden and the beach and catching up on my Central Asian reading. Here's what is in my pile. 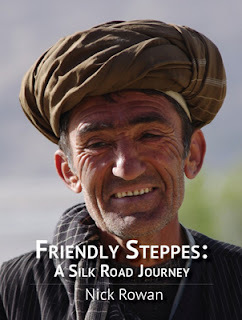 Finally my copy of Nick Rowan's Friendly Steppes: A Silk Road Journey has arrived. It was launched at London's National Geographical Society in early December. Nick Rowan is the editor-in-chief of Open Central Asia magazine, and is passionate about the region. The book chronicles Nick's 7-month journey and adventures from Venice through Eastern Europe, Iran and the steppes of Central Asia to China along the modern "Silk Roads" of today. Update: A Kindle version of this book is now available. Then there's Monica Whitlock's Beyond the Oxus: The Central Asians. Whitlock was the BBC's Central Asia correspondent for many years. Published in 2002 to outstanding reviews for its research, readability and balance, this book has been hard to track down. The focus is on the upheaval in traditional lives since the Soviets arrived in Uzbekistan, Tajikistan and Afghanistan. 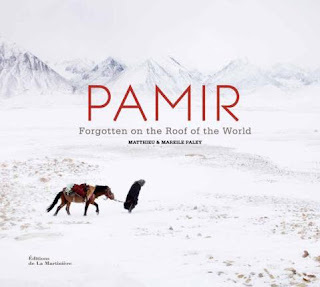 A new publication Pamir: Forgotten on the Roof of the World by French photographer Mathieu Paley and his wife Mareile is still waiting for an English publisher, so I have the French edition. (It is also available in German). In the furthest reaches of Afghanistan, in the Wakhan Corridor, lies an isolated, arid land from which the highest mountain ranges in the world radiate: the Pamir plateau. At over 4,300 metres some 1150 Afghan Kyrgyz live there, suspended in time, trapped by history. In 2000 Paley encountered a caravan of these proud nomads and their great leader, the Khan. He subsequently returned three more times, in the middle of winter, walking the length of the frozen Wakhan River. The images are extraordinary, revealing a rarely photographed, disappearing world. This is a marvellous 1977 book from Aurora Press, the great Leningrad arts publisher. It focuses on the architecture of Tashkent, a city that I enjoy very much. It is an excellent record of the gems of Soviet architecture, some of which have already been demolished. Kyrgyz embroidery is a design treasure house: experts say that there are about 200 design elements, the combinations of which produce breathtaking compositions. As I will be spending about 10 weeks in Kyrgyzstan in 2013, I am interested to learn more about the history, the meaning of the patterns and the technique of Kyrgyz ornamentation. This Russian/English bilingual edition is from Bishek publisher Raritet. Max Penson photographed the transformation of Uzbek society from a feudal society into a modern Soviet republic from the 1920s through the 1940s. His daughter, Dina, was the first female photojournalist in Uzbekistan. I brought back three Penson photography books this year, all of which are stunning. There is Dina's The Unknown Penson, the Archive of the Photographer's Daughter, published in 2005 in an edition of 300. 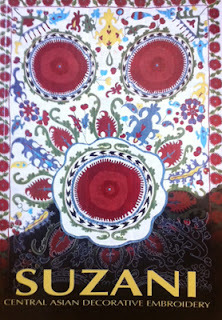 I also bought the catalogue from Dina's retrospective exhibition at Moscow's Galeev Gallery in 2007. 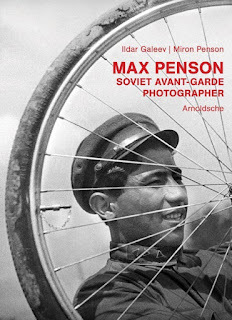 The latest Penson book is Max Penson: Photographer of the Uzbek Avant-Garde, 1920s-1940s, which was published by Arnoldsche Art Publishers, Stuttgart in 2011. Max Penson's unparallelled photographic archive was saved by Dina and her husband, the film maker Fazulla Khodzhaev, after the 1966 Tashkent earthquake. This 2011 publication by the International Institute for Central Asian Studies (IICAS) was supported by UNESCO. It is written by Olga Sukhareva (1903-1983) the high-profile specialist on Central Asian ethnography. She was born in Samarkand and started gathering materials on embroidery in the early 1930s while working in the Samarkand Museum. Later, the art historian worked in the Institute of Ethnography in Moscow. Unfortunately, Sukhareva could not publish the book in her lifetime and in the late 1980s the manuscripts were published in Moscow, in Russian. IICAS decided to publish these materials in Uzbekistan, in English, to bring the art of Central Asian embroidery to a wider public. 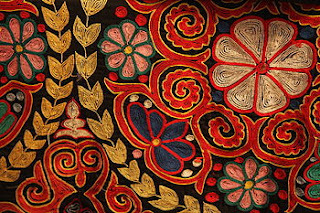 The book covers the history of embroidery in Central Asia from the 19th century, preparation and dying of threads, ornament drawing and embroidery stitches, as well as the changes that have occurred such as the styles shifting, the transformation in meaning of patterns, and the dying-out of old motifs. It is gorgeously illustrated with photographs from the Bukhara and Samarkand museums as well as detailed hand drawings of stitches. I picked up my copy in Samarkand: the 17cm x 24 cm format makes it easy to travel with. This title was strongly recommended by talented Canadian weaver Sharon Broadley, who travelled with Uzbek Journeys in October 2012. I am so glad I ordered it directly from the author, Eric Broug. Travelling throughout Central Asia one is dazzled by the geometrical design on buildings, on tiles, on metals, and in metals. It is one of the most distinctive aspects of Islamic art and architecture. This is a practical book, demonstrating how to create pentagons and hexagons with merely a ruler and compass, just as the masters did centuries ago. 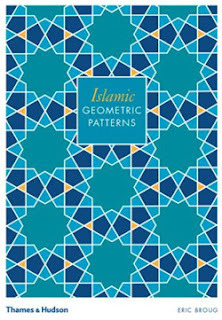 The book includes an interactive CD-ROM that contains all twenty designs presented as animations, printable grid paper pdfs, printable colouring designs, interactive photographs and an extensive photo gallery showing highlights of Islamic geometrical compositions. Wishing all Uzbek Journeys clients and readers an interesting year ahead, full of adventures and some time for sipping green tea.